Install Your Own Git Repository With Web Interface On Your Server with recent few powerful Free Git Software which will give the look and features on Frontend. Github is the best example of Git Repository With Web Interface. But the main software for Github, that is the server installable software, is priced like a car. It is closed source. Basically it is very funny that a repository (Github) which hosts Free Softwares with GNU GPL or MIT is itself a closed source, although the heart, that is the git, is Free. The mid four digit price of Github is for the Twitter Bootstrap (that is Free too) like Web Interface and custom Command Line Tool. Let us see how to Install Your Own Git Repository With Web Interface On Your Server plus the other options. Minimum pricing is $5,000.00 per year. It is not possible to use by a new Free Project. The known Git Repository With Web Interface with GNU GPL license actually were not that user friendly or good looking. Fortunately after a huge searching, we found two Free Git Repository With Web Interface softwares which are practically Github alike. 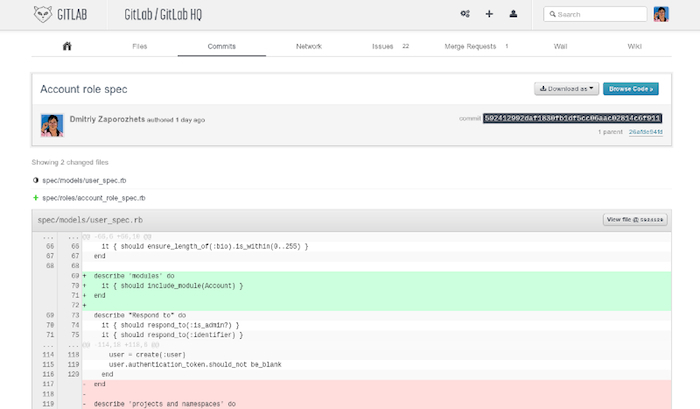 GitLab runs on Rails and Gitolite. This is Free and distributed under the MIT License. Minor glitch that it is not GNU GPL probably will not hamper the most. Gitlist is written in Perl and backed by Catalyst web framework. You need to know a bit more because there are many things needs to be known. Now the thing is that, you can definitely use your Install Your Own Git Repository With Web Interface On Your Server, you will need to pay for SSL too. But if this hosting and SSL becomes free, at least for a small team ? Exactly that can be done with our beloved Heroku Cloud. If you signup from Facebook as App, you will get SSL free too. The parent is Salesforce.com, they are quite aware that Debian Plus Rails plus nginx will actually cover a big number of needs. It is funny that you basically have to use Heroku’s Git to deploy your self hosted Git. But the setup needs to be configured like we said for Advanced Commands for Perfect Setup for Heroku in case of LAMP setup (basically it is becoming LAMP in that case). you will even not need a full fledged server for a big part – it will run on Rackspace Cloud Files / Akamai CDN. Rackspace Cloud Files has SSL, its more secure, geographically distributed and save the bandwidth. So what Github asked for $5000+ became zero or if use Rackspace Cloud Files with it – $12 per year. All with SSL and cost of the server. This Article Has Been Shared 423 Times! Twitter Bootstrap Design Website on Free Dropbox Cloud Guide ! Free Cloud Hosting with great designed website within few minutes for you. Here is how to do it. Cite this article as: Abhishek Ghosh, "Install Your Own Git Repository With Web Interface On Your Server," in The Customize Windows, January 11, 2013, April 26, 2019, https://thecustomizewindows.com/2013/01/install-your-own-git-repository-with-web-interface-on-your-server/.